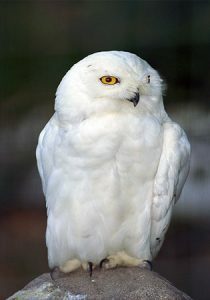 The Snowy Owl is to be honest my favourite animal it obviously a bird a large bird of prey it’s a carnivore snatching small birds and rodents it flaps his/her wings silently unable to be heard from its prey. The yellow-eyed, black billed white bird is easily recognizable. It is 53-65 cm (20-26 inches) long with a 125-150 cm (50-60 in) wingspan. Also, these birds can weigh anywhere from 1.8-3 kg (3.5-6.6 lbs). The adult male is virtually pure white, but females and young birds have some dark scalloping; the young are heavily barred, and dark spotting may even be predominate. Its thick plumage, heavily-feathered feet, and coloration render the Snowy Owl well adapted for life north of the Arctic Circle. There eye sight is unique as for the only bird that can see heat they eat there prey whole if its small enough ignoring all bones feathers for when it its finished digesting all the flesh it throws up the bones hair and feathers. A full grown owl has few predators making it an ideal hunter but when young they depend on its parent to defend them from artic fox’s and other owls.